According to news reports, a devastating loss of Arctic sea ice is now forcing a Russian science expedition to evacuate. Last year, Russia was forced to look hard for an ice flow sturdy enough to host a 16 man polar science expedition to the rapidly melting Arctic Ocean. The flow, located near the center of the thickest ice, was expected to support this scientific expedition all throughout the summer. Yet, by the middle of May, the ice flow had begun to disintegrate, forcing an emergency evacuation of the researchers. “The ice is disintegrating,” a ministry spokeswoman told AFP. “Cracks appeared in the floe.” The station is currently home to 16 personnel. “The destruction of the ice has put at risk the station’s further work and life of its staff,” the ministry said in the statement. “A collapse of the station’s ice floe poses a threat to its continued work, the lives of the crew, the environment close to the Canadian Economic Zone and to equipment and supplies”, a note from the minister reads. An icebreaker had been dispatched to rescue researchers along with heavy equipment used as part of the expedition. But risks remain high that valuable equipment will be lost. 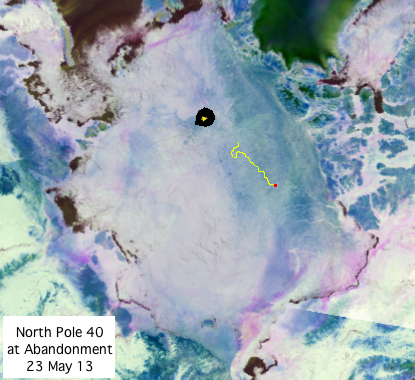 The above image, provided by A-Team over at the Arctic Ice Blog notes the current position of the expedition. The expedition had been placed near the center of the remaining thick ice. However, rapid motion of the ice pushed the expedition closer and closer to the Beaufort Sea, a region where powerful currents can often result in sudden ice fracturing. Conditions in the Arctic over the past year created a high degree of risk for the Russian expedition. Very little thick ice remains to the Arctic. Volume is currently in record low territory and even the thickest remaining ice is increasingly fractured and mobile. Since the 1908s, end summer ice has lost 80 percent of its total volume, putting it at risk of complete melt within the next few years. This winter, a major sea ice cracking event fractured a large section of sea ice near the expedition. This past week, an influx of warmer air added further stress to the ice. For the region near the expedition, ice stress appeared to pass a tipping point as melt and break-up resulted in a heightening risk to lives and equipment. This event is just one more in a long string of uncanny and extraordinarily rapid melt events affecting the Arctic. It is quite possible that major Arctic research expeditions on the sea ice will be rendered more and more difficult and dangerous as the ice continues its rapid disintegration. At this point, all Arctic expeditions on the ice are at increased risk. Overall, chances for total or near total ice melt remain at around 10% for the end of summer 2013. Though comparatively low, this risk is substantial in that it is the first time in the human record that sea ice has a chance to completely melt out. Overall, sea ice area and extent losses have been about average for May. But the important measure, Volume, won’t come in until June. By that time, it will be more apparent if stresses on the ice are resulting in a terminal or near terminal decline. Major heating and energetic impacts tend to multiply come June. That said, motion and melt in certain regions appears strange and uncanny. The Beaufort is experiencing cracking, thinning and a kind of wip-lash as weather systems and warmer air rake over the ice. On the other side of the Arctic, a rapid thinning appears to be ongoing in the Kara and Laptev seas. And all over the ice, ripples and cracks are appearing with greater frequency. At the very least, summer is likely to bring a very unstable, mobile and fractured ice state. Meanwhile, warmer air is advancing. So it appears things are likely to get interesting rather rapidly. Best hopes to this Russian crew and all those on the ice this year. A destabilizing climate is making it a much more hazardous place to work.